Of course, I was asked just how hot the outfit was many times, just as I had often been asked when I was doing programs at places like Stones River National Battlefield and Kennesaw Mountain National Battlefield Park when I did programs in the summertime there. The short answer is yes, it is quite warm. It’s wool. Today wasn’t as bad as it could have been because I was inside all the time and we had a nice breeze coming down the street and through the open doors. So although I was sweating considerably it was not remotely as bad as it could be, or as bad as I have experienced before. But at any rate it was worth it because I got to interact with a lot of people, and that is always fun. There was one tourist from the UK who I had a really good talk with, probably a good 15 minutes or so. He was a highly intelligent man and very well informed on the American Civil War. Anyway, here is one picture we got. The uniform is far from perfect, but it is the best I could do on short notice. 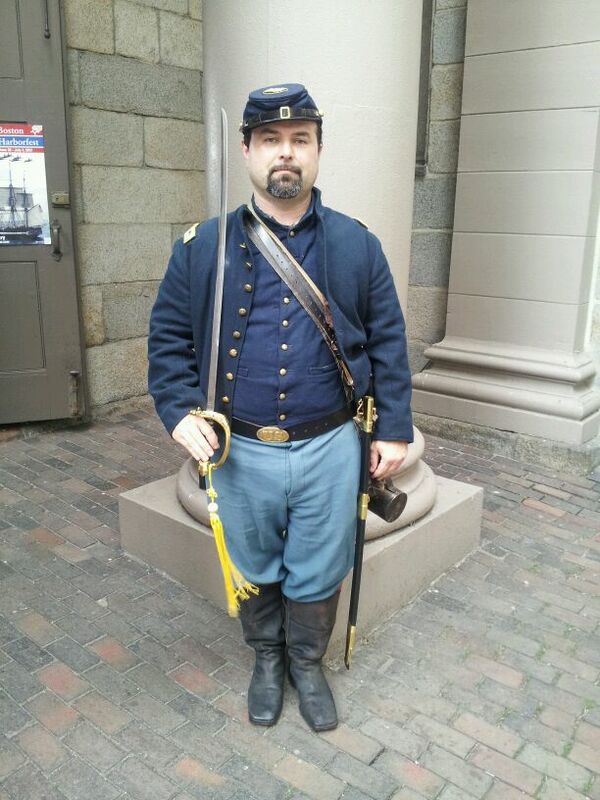 Me as a Civil War Colonel in fatigue uniform. At any rate, so many of my coworkers wanted me to be Colonel Robert G. Shaw that I guess I pulled it off, sort of. At least I probably looked more like him than some of the other Colonels from King’s, like Fletcher Webster or Paul J. Revere.